Bought ADVANTAGE II and got scammed by receiving OLD box of plain Advantage in green box from another COUNTRY ! 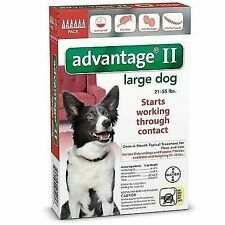 Bought the Advantage II as described and PICTURED but received the OLD regular Advantage in a GREEN BOX that is some other COUNTRY and can NOT even read directions. TERRIBLE PRODUCT...We tried it anyways and it must be water in the tubes...It DID NOTHING to get rid of fleas ! One end of the box was smashed and 2 of the 6 tubes had been popped open.